Sorry, got in summer camp mode there for a minute. Apparently a far-too-enthusiastic clown camp of some sort. Sorry about that. Things are great here at Camp NaNo… at least, the part in my head. In there it’s all pleasantly cool breezes off the lake and clear sunsets just before campfire and s’more time, with writing and horseback riding in between activities. Outside of my head, not so much. Both of the kids have been sick for a week with a nasty head cold and occasional fever. We’re constantly battling over nose wipings and medicine takings, and nights have been rotten. Also, and I don’t want to perpetuate a stereotype here, but they both have what is generally known as “the man cold.” I’m needed at all times, which doesn’t leave a lot of time for writing. I’m still hovering around 2,000 words. Not great. But the week hasn’t been all bad, not by a long shot. I’m grateful that I’ve (thus far) escaped with only a slight stuffy nose and a few headaches. 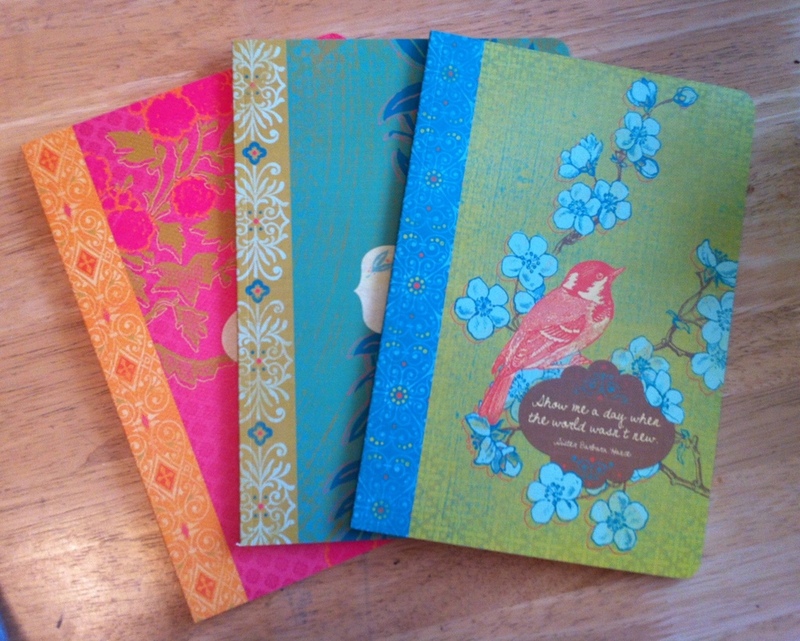 I had one day where we got out of the house and to the dollar store and Walmart, and it shall go down in history as “the day I got those super pretty notebooks.” That was the same day my paperback copy of the Deptford Trilogy came in the mail, and my sponsor goodies for camp. SWEET! Even better, the wonderful Jae at Lit and Scribbles featured me/this blog on Wednesday. Isn’t that nice? I’m very excited to see who else she’s got lined up to talk to this month– you should go check it out, too! New friends are always fun. I guess that’s about all I have to report for the week. Almost done “final” (oh, it is to laugh!) revisions to chapter 6 and 7 of Bound, and I may have found the perfect critique partner if she decides to stick with me. The other new project still insists on bouncing around in my head, but that’s OK- I’ve got these new notebooks handy so I can brain-vomit the ideas out fairly quickly. So far next week’s looking pretty quiet around here, but I have a few posts scheduled (one featuring many immoral things you don’t want to hear about). Don’t go too far, though; if anything interesting happens, or if I really need to procrastinate, I’ll be around. Have a great weekend, everyone! Anybody got big plans? This entry was posted on Friday, April 5th, 2013 at 7:05 am	and tagged with camp nanowrimo and posted in blogs, Family, NaNoWriMo, writing. You can follow any responses to this entry through the RSS 2.0 feed. Those are some sweet notebooks. More Camp NaNoWriMo for me this weekend, maybe some time at the park with my toddler if the weather is nice. That sounds like an amazing weekend! What’s the weather usually like this time of year where you live? We’re still cold (will be until June, ugh), and always unpredictable. Aren’t they pretty? I usually prefer them with coil bindings so they’ll lay flat, but I couldn’t pass these up. I’m really curious to know what ‘nanowrimo’ is exactly? Living in the UK as far as I know we don’t have it, hence the confusion. Camp NaNoWriMo is basically NaNo light. Lite? This year they’re letting you set your own word-count goal, and it feels more relaxed. Still a good way to meet other writers and get those words out, though. Love those notebooks! And I read the post featuring you! So exciting! Keep going, Kate! You can rock this novel!